To view existing coupons in your Stripe dashboard go to Billing → Coupons. 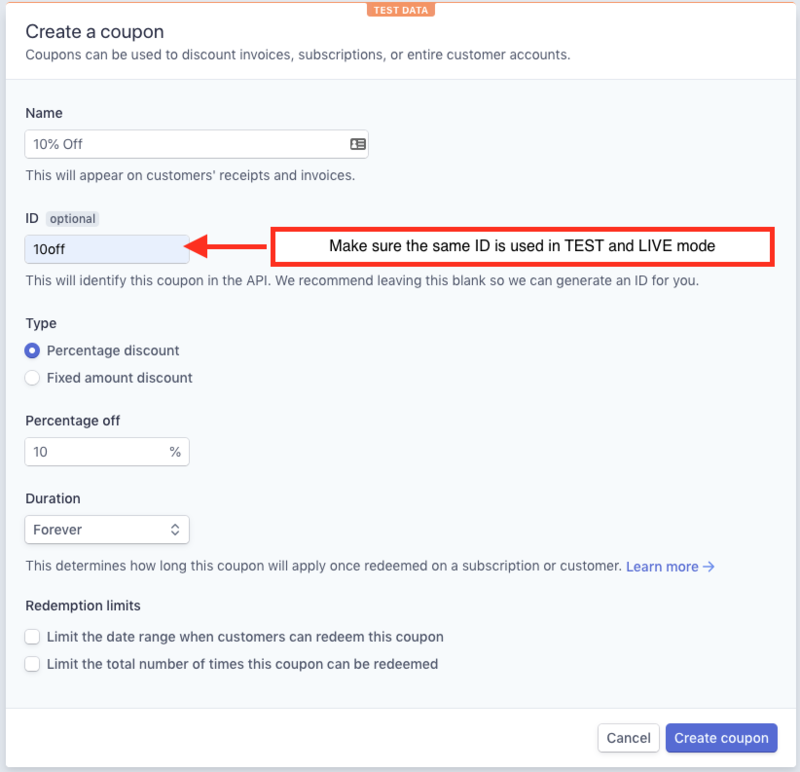 While in Test Mode you may only create and edit coupons in your Stripe Test Coupons. Before switching to Live Mode, make sure the same coupons (with the exact same IDs) are created in your Stripe Live Coupons. To add a coupon click the New button at the top right and give it a name. The ID is the coupon code and is what the customer will have to enter exactly to apply the coupon to their payment(s) or subscription. Although the coupon ID field is stated as optional, you will need to fill it in to make sure it works for your site visitors. Next, you can specify a Percentage or Fixed amount discount type and value. For one-time payment forms, Duration and Redemption limits will be ignored. This is because Stripe intended these options to be used with subscriptions only, but we tied them into one-time payments in WP Simple Pay Pro for ease of use. For subscription payment forms, Duration and Redemption limits are honored. Details can be found by following the “Learn more” link in this area. Note that you cannot edit coupons once created except for the name and metadata. This is by design from Stripe. To add coupon code fields to your payment forms, see the Other Form Elements → Coupon Code Field section in the On-Page Form Display Options.